Winter is coming. 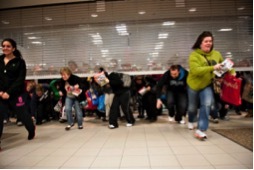 But, sadly, Game of Thrones won’t be back until next spring. If you’re experiencing withdrawal, here’s something to tide you over—A look at the DISC personality styles of four major Game of Thrones characters. Which one are you most similar to? Key characteristics: Intelligent, dominant, and fearless. Tywin is a calculating, smart, and politically shrewd man. He is also demanding, ruthless, controlling, and more than a little terrifying. Tywin doesn’t take orders—He gives them. He has dedicated his life towards maintaining the Lannisters' reputation, and making sure that House Lannister is respected, feared, and obeyed in all things. The crest of the Lannister family features the lion—the king of the jungle is a very appropriate symbol of what Tywin stands for. He is a revered battle commander who has proven himself strategic, bold, and powerful. He is also fearless—A man of action that never second-guesses his decisions. When Tywin is in the room, he commands attention. He expects to be in charge, and holds more power in the court than even the king. Anyone that stands in Tywin’s way or challenges his power is met with swift, decisive retribution. (Red Wedding, anyone?) In the battle over who will be king, Tywin would never be content to stand back and see how things played out. He is the architect of his own destiny, and second to no one. 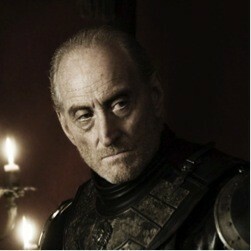 Do you share any of Tywin’s qualities? If so, like Tywin, you like to take charge. You like it even better when others take your orders. Key characteristics: fun-loving, pleasure-seeking, and outgoing. 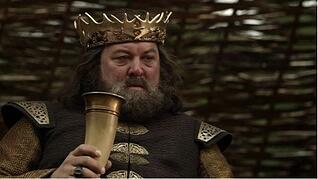 Robert Baratheon was a large man with a large appetite. Whether it was with food, drink, or women, he had a lust for life and wanted nothing more than to enjoy himself and be entertained. As king, Robert was able to lead not through intimidation, but rather through the charisma of his larger-than-life personality. He had a way with words, and if he set his mind to it he could charm his enemies into becoming his friends. Not someone to do things out of obligation, Robert preferred to only do the things that gave him pleasure. He was focused on his own needs much more than the needs of the people he ruled. He liked the attention he got from being king, and took great pleasure from the adoration of his subjects. However, as a leader he made impulsive decisions because he wanted to get serious matters over with quickly so he could move on to the next party. Not necessarily a hands-on king, he often left the dull everyday details of running the kingdom in the hands of others. He was more likely to become the subject of a drinking song than a heroic ballad. Overall, his biggest fault was not taking things seriously enough. Robert Baratheon was charming and fun-loving, but so self-focused that he was blind to the feelings of the people around him. Underestimating the anger of his wife, Cersei, is what ultimately did him in. (That and underestimating the running speed of a wild boar.) It’s very fitting that he died on a hunting trip doing what he loved best—drinking, having a good time, surrounded by admirers. Do you share any of Robert’s qualities? If so, like Robert, you’re fun-loving, quick to laughter, and lighthearted. Strategy isn’t really your thing. You’re more checkers than chess. Key characteristics: loyal, honorable, and steady. Poor Ned. Lost his head. 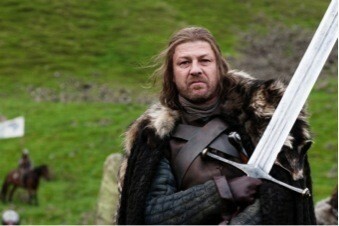 Ned Stark was an excellent leader because he was smart, reasonable, and empathetic. He had a respect for tradition, and an unwavering sense of honor and justice. He wasn’t a pushover—He did what needed to be done, and never shirked his responsibilities. When he executed enemies it was never because he was angry, but rather because it was the law. He believed in a just punishment for every crime. Although to outsiders he could appear reserved, those that knew him well found him to be fair, kind, and honorable. He was also a devoted family man, fiercely protected of his wife and children. A man of faith, he kept of the traditions of the “old gods.” He followed his moral compass to the end, always choosing what he thought was right over what was the more politically savvy (or self-protective) choice. Do you share any of Ned’s qualities? If so, like Ned, you have a strong sense of right and wrong, and are loyal and fair. A belief in the importance of family and tradition that serves as the primary foundation for your life. Key characteristics: shrewd, forward-thinking, and strategic. Petyr Baelish is a man that knows what he wants, but goes about getting it in a much more quiet, and subdued fashion than some of his more outgoing counterparts. Naturally an introvert, he has a rich and complicated inner life, and rarely shares his true feelings with others. He doesn’t take pleasure from social gatherings, but when he puts his mind to it he is excellent at talking to people. For him, interacting with others it’s more of a strategic move-- He uses his words and demeanor to lull them into a (false) sense of complacency. It’s easy to picture Petyr always standing at the margins of the action, observing, planning, and plotting his next move. To him, life is one enormous game of chess, and he’s set his sights on capturing the queen. He prefers to control things from behind the scenes, rather than openly participate. He tends to hide his true motivations from others, using the element of surprise as a strategic technique. 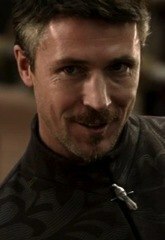 Petyr is incredibly smart and shrewd, and takes great advantage of the fact that others tend to underestimate him. Few in competition for the throne one would consider Petyr a major player in the game. But often, he is the one that knows the most about what’s happening, and he takes the time to methodically gather information and plan the perfect strategy. His enemies often don’t even realize that they’re in his sights until it’s too late. Clearly, people would be wise to take him more seriously. Do you share any of Petyr’s qualities? If so, like Petyr, you are smart, shrewd, and hold your cards close to your vest. You are a master strategist, and have a talent for being able to control things from behind the scenes without anyone actually realizing it. Key characteristics: Witty, outspoken, straightforward, empathetic, and bold. The (d)ISC special pattern is an interesting one. It shows I, S, and C, characteristics all above the midline. This means that a person with this personality type exhibits qualities of I, S, and C patterns of behavior. Interestingly, though, the low D in this personality type is expressed in an unexpected way. Instead of showing few qualities of a D, the (d)ISC personality is actually compelled to rise to the challenge and adopt D-style behaviors when the situation calls for it. In other words, the person’s high I, S, and C qualities work together to bring out the D.
This complex personality type is definitely reflected in Tyrion Lannister. Although it’s not in his nature to want to be the leader, he’s willing and able to step up lead when he is needed. 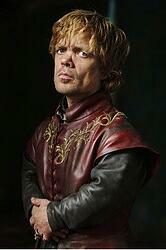 Like an I, Tyrion is fun-loving, witty, and extroverted. Like an S, Tyrion has a highly-developed sense of justice and empathy. Like a C, he is a brilliant strategist, smart and calculating. Like a D, Tyrion is bold, decisive, and charismatic. In the absence of a leader, he will step forward and take action. When he does, he is a strong, competent leader that has the ability to devise and enact clever (and daring) strategic plans. In the Battle of Blackwater, for example, he was the key force responsible for victory. King Joffrey, self-serving and cowardly, ran away from the battle when things seemed hopeless. Without Tyrion stepping forward to take charge (with a plan so ingenious, no one saw it coming), the city would certainly have fallen. Unfortunately, also like a D, he is impulsive and often doesn’t think before he speaks. In situations that call for finesse, he doesn’t typically excel. His temper and his outspoken nature often outweighs his more rational side. Despite the fact that he is the most intelligent, fair, measured, and well-balanced leader in his family, Tyrion doesn’t get the respect he deserves. His dwarfism caused his father to reject him, which in turn made him feel like an outcast most of his life. This is perhaps one of the things that contributed to his highly-developed sense of sympathy for those that have been mistreated. When Tyrion doesn’t need to be in a leadership position, he has no problem stepping away from the action. He doesn’t actively seek power, and would prefer to stay out of the line of fire. He has a love for women and drink, and will happily indulge those interests for as long as he possibly can. Do you share any of Tyrion’s qualities? If so, like Tyrion, you are clever, strategic, witty, charming, extroverted, steady, and capable. With that mix of qualities, you can do anything you set your mind to. Which character do you relate most to?